Come meet us at our booth at SXSW, the annual festival on the cutting edge of interactive media, film and music in Austin, Texas USA . Come and find Hendrik Dacquin doing all the networking whilst sauna and ice swimming in Helsinki. Zender’s co-founder and CTO Patrick Debois talks about THE EVALUATION PROCESS OF ULTRA LOW-LATENCY SOLUTIONS. Get an overview of the technical solutions available for low-latency streaming and how they work, and discover the operational aspects of integrating the different low-latency streaming solutions. From 3 to 6 October 2018, DiG Publishing will gather senior executives of leading European publishers and startups in Lisbon, Portugal. Let’s 'dig up' new audiences and revenue streams to connect startups and leading European publishers. Find Zender at booth 10F42! IBC sits at the global crossroads of the media, entertainment and technology industry and provides a full and vibrant experience, whether you are a student or CEO, an innovative start-up or media superpower. Insightful plenary talks and a range of afternoon breakouts to choose from. Don't miss us on the demo floor where we'll be presenting the first live interactive trivia quiz show hosted by a cartoon character. Discover how radically new interactive formats lift viewer and engagement rates at Zender's stand at NAB in Las Vegas (SU11713 Upper South Hall). 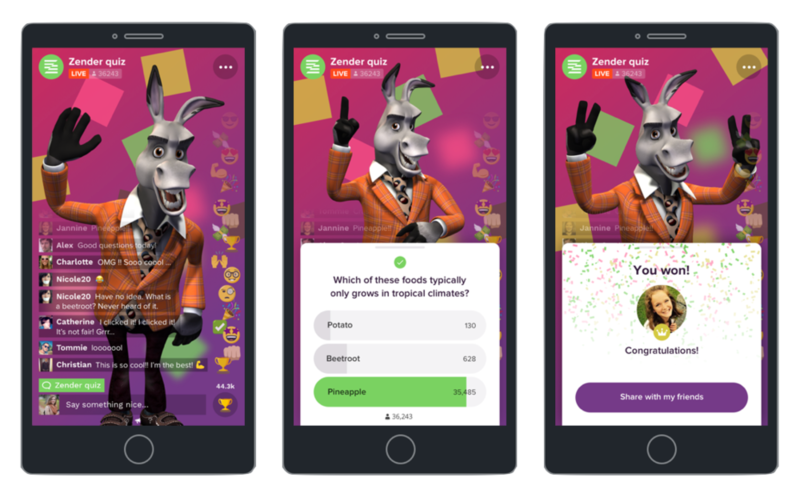 See how quickly and cost-efficiently Zender has you up and running with your own stunning interactive live format - did anybody say trivia quiz? Zender is joining the booth of Wondermedia (P3 8.10) MIPtv, the global TV and digital content market for all genres and all screens. We'll be presenting the first live interactive trivia quiz show hosted by a cartoon character. Please come and visit us at booth P3 B.10. OMR is Europe’s leading festival for online marketing and digital advertising by Online Marketing Rockstars. Find more about OMR here. Attending the Expo area of OMR 2018? Come by Media Match booth on the premium Expo Area on Hall A4. Beam me up to have a coffee and talk about interactive live streaming :).